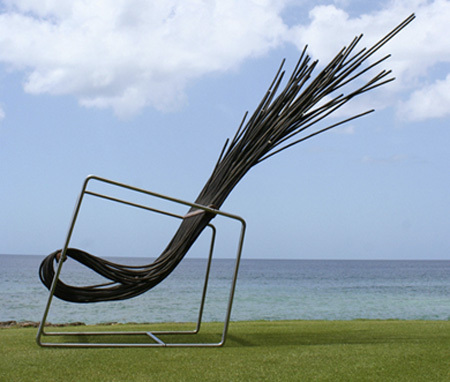 Creative modern chairs and unusual chair designs from around the world. 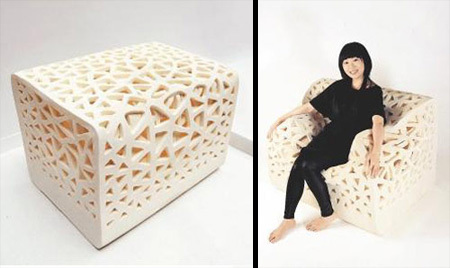 Modern foam chair becomes an armchair when someone sits down. 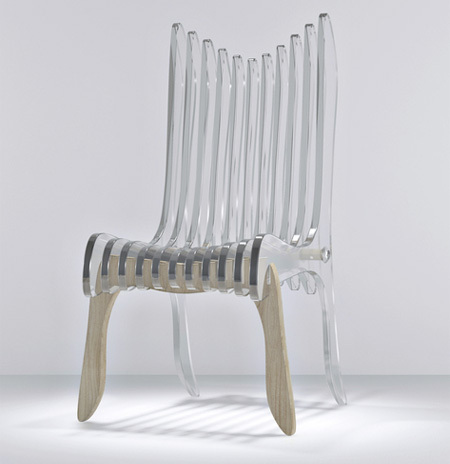 Unique chair that is a combination of transparent plastic and wood. 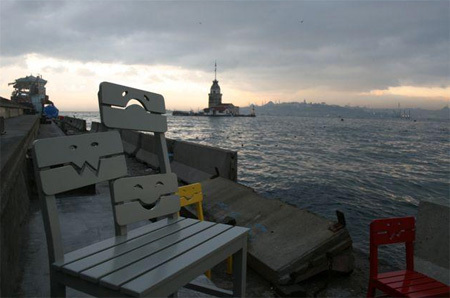 Beautiful modern chairs designed by Bora Cakilkaya for P-Arch. 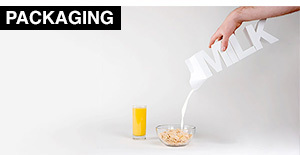 Designed by Jouko Järvisalo for Finish manufacturer Mobel. 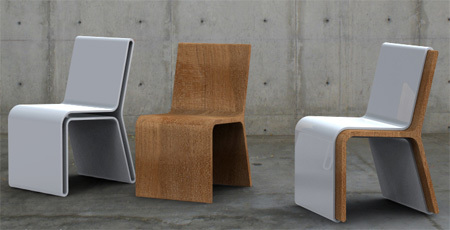 Cool “two chairs in one” set designed by Alberto Villarreal. 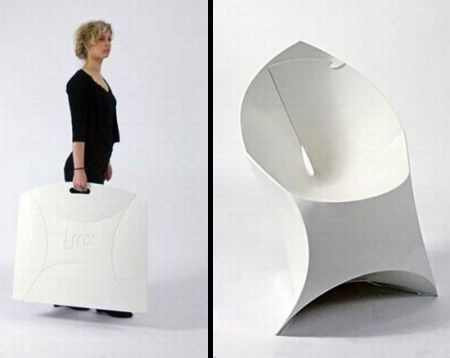 Innovative chair that folds flat for easy storage and transportation. 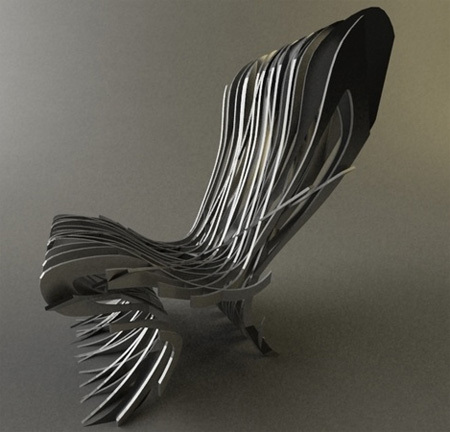 Cool rocking chair designed by London’s Supernatural Studios. Unique chair by Bulgarian based industrial designer Yuliyan Mikov. 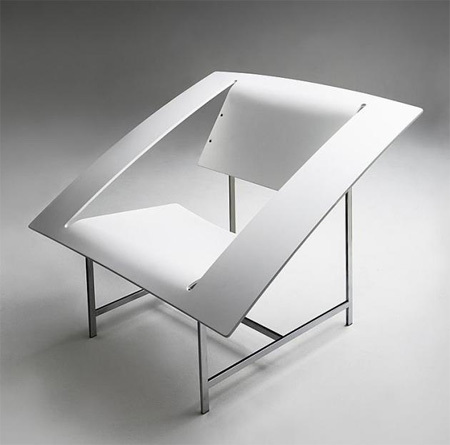 Beautiful contemporary chair prototype designed by Tetsu Kataoka. 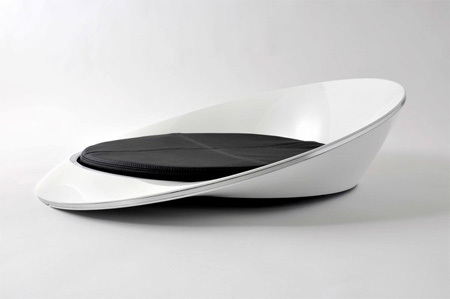 Creative Kanutos lounge chair designed by Victor Monserrate. 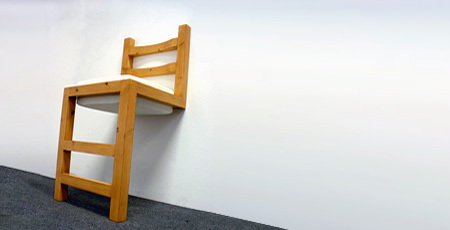 Creative modern chair uses the wall to support itself. Cool armchair for your garden by Italian designer Davide Conti. All of these chairs are good ideas. But their are a few problems. For example, if you walk into some ones house and see a block of foam (The Breathing Chair) you would think there is something wrong with them. Another problem is, well if you think about it half of these chairs look very uncomfortable. especially O&O Chair, would you want to sit in that for even 10 minutes!?! i agree they all seem pretty uncomfortable specially the SARA you may think that is the most comfortable of the whole article but look closely low back design with no neck support, also that roots chair looks like a murder weapon one misstep and you get impaled by your own furniture. I like the sara one! 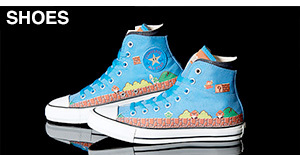 @Mr.Great & latincow: These are designs are meant to be, well, designed. It’s like high fashion…Stilettos aren’t comfortable, but they’re hot. It about aesthetics, this isn’t a post for unusual lay-z-boys. I’ve noticed that some people are very critical of the practicality of many featured pieces, when they are meant to be inspiring and unique; not necessarily used in an every-day setting. These are works of art that you sit on. 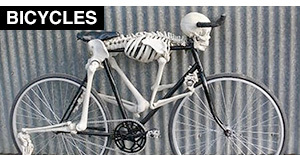 If you are looking for normal and practical, may I suggest a Pottery Barn catalogue? Sorry Rayan but your comment was just pompous – if a chair cannot function properly as a chair (eg. be comfortable to sit on) it is not really a chair. It can only be described as a chair-shaped sculpture and therefore is nowhere near as clever as it pretends to be. Forumlogic, I don’t think you understand design. Sorry if this comes across as pompous, but a chair is a chair if it was designed to be a chair and can be sat on- comfortable or not. A bed of nails isn’t comfortable to lay on, but you don’t call it a bed-shaped torture device, do you? No, it’s a bed of nails. You can argue semantics till you’re blue in the face, but these are chairs, and you’re being a negative nancy. well i think that most of them are MUCH confier than they look, and to be honest, alot of furniature that calls itself a “chair” is very unconfortable. for example, stools, are very irritating to sit upon for extended periods of time, due to no back support. what what. 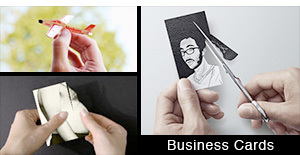 I really love the cool comtemporary designs! Personally, i think Rayan has a point. 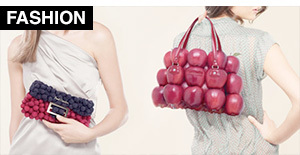 Designers sometimes get too much into it that they end up doing an art piece rather than a functional piece. form should always follow function. The breathing chair has a cool concept, but i don’t think anyone would be sitting in it after 6 months of accumulated dust. it looks really hard to clean. @Rayan i totally understand the design and art point of view but let’s not forget that these are furniture after all so if you actually buy it you would want to sit in it wouldn’t you, i’m ok with the idea of a chair like the roots from an artistic point of view but there is no practicality into the design. and sorry if i don’t agree with your point of view and it’s ok, different strokes for different folks, and every opinion counts but from my point of view as an engineer and a consumer the SARA chair looks really uncomfortable and the roots looks like a murder weapon. I like the Flux Chair one ,ha! You can sit on a pile of buffalo chips. Does that make it a chair because someone calls it a chair? 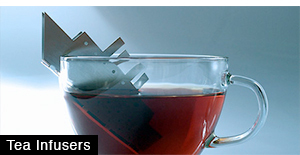 I think what matters in the form and function debate is the design brief the designer was working to. If it was a product designed to be a statemtent of creativity and be looked at more than sat in, then the ‘roots’ chair fulfills the brief. If its meant to be a practical comfy chair, it didn’t, simple as. SARA Armchair looks very soft. breathing chair is a pretty cool concept. would look better in a different color though, maybe black? or red? 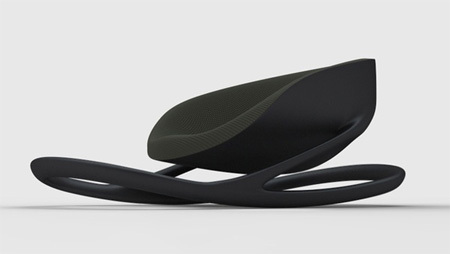 flux chair is cool too, looks like its made of something lightweight, interesting how it supports from all the curves very nice! ya thats true some chairs look uncomfortable but who create it must be creative and dare to do something different…who dares budy’s???? ?